The theory of directionality is fine. But in the real world, directional microphones - however expensive - are far less perfect than the theory would suggest. The pickup pattern varies with the frequency of the sound source, in some cases quite dramatically. Typically a directional microphone is less directional at lower frequencies and more directional at higher frequencies, but within specific frequency ranges that depend on the structure and design of the individual microphone, the directionality may exhibit "lobes" or "leakage" - unwanted peaks of sensitivity in directions other than those intended. In general, the more directional the microphone design the greater these unwanted effects are. So directionality comes with a price - uneven frequency response, variation in frequency response for off axis sounds and unwanted pickup from the rear and sides. Often, these deficiencies are below the threshold of audibility, but in the presence of significant background noise or when using extremely directional microphones, recording quality can suffer and it's very difficult indeed to correct for these failings in post-processing. It's also important to realise that, due to the way sound disperses in the environment, the further any microphone is from the sound source the more its pickup pattern departs from the ideal. 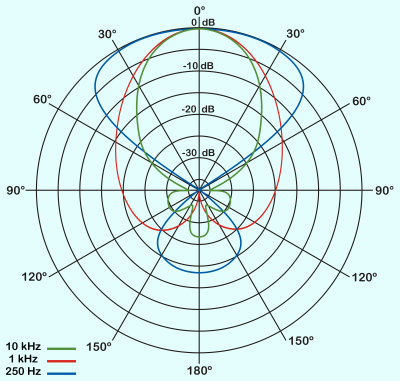 This is particularly the case at low frequencies, which are highly non-directional. So for far field recording it's not really worth using a shotgun microphone. The only really directional microphone at medium distances is the reflector or dish mic - due to the active focusing effect of the dish - but that comes at the expense of considerable distortion of the sound.